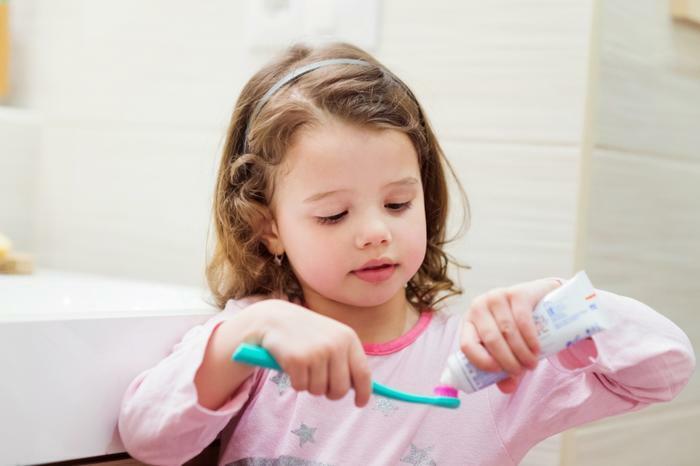 Many young children are using more toothpaste than recommended by dentists, according to a recent study conducted by the Centers for Disease Control and Prevention (CDC). Using too much toothpaste can be harmful to kids’ health as it can lead to children ingesting too much fluoride while their teeth are developing, the CDC says. “Fluoride use is one of the main factors responsible for the decline in prevalence and severity of dental caries and cavities (tooth decay) in the United States,” the agency wrote. After evaluating the brushing habits of about 5,000 children ages 3 to 15, the CDC found that about 60 percent of children and teens aged 3 to 15 used a half or full load of toothpaste. Among kids in the 3 to 6 age range, about 12 percent used a smear, 49.2 percent used a pea-size amount, 20.6 percent used a half load, and 17.8 percent used a full load. "The findings suggest that children and adolescents are engaging in appropriate daily preventive dental health practices," the authors said. "However, implementation of recommendations is not optimal." Children younger than 3 should use an amount of toothpaste that is the size of a grain of rice, and kids ages 3 to 6 should use no more than a pea-size amount, the CDC stated. Increasing to a “pea-sized” amount is best put off until this time frame because “by which time the swallowing reflex has developed sufficiently to prevent inadvertent ingestion,” the study authors explained. "Ingestion of too much fluoride while teeth are developing can result in visibly detectable changes in enamel structure such as discolouration and pitting (dental fluorosis),” the researchers said. The CDC survey also found that most children (nearly 80 percent) began brushing after 1 year. The American Academy of Pediatrics (AAP) recommends that a smear of fluoride toothpaste is used as soon as baby teeth erupt, from about six months on.